State ballot Question 3, which asks voters if they want to keep a transgender civil rights law, has put the spotlight on bathrooms. But the marketplace for bathrooms isn’t waiting for election day. There’s a wide range of changes underway. After much discussion, Tufts Health Plan in Watertown in May posted an all-gender symbol and some explicit guidance on single-user bathroom door signs. 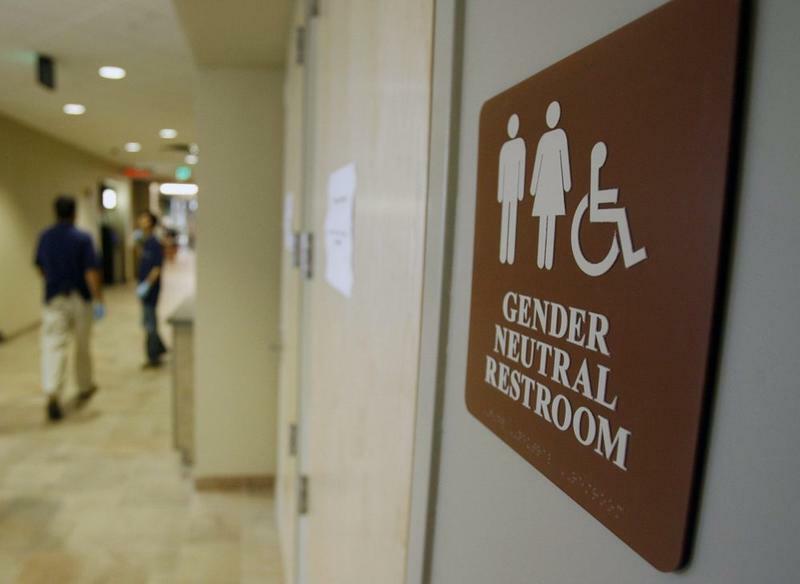 Gender-neutral signs and single bathrooms are becoming routine in new buildings, according to architects and contractors interviewed for this story. “Since about 2015, it’s become an ordinary portion of the design discussion,” says Rebecca Berry, president of Finegold Alexander Architects in Boston. But Berry says her clients, most of whom are large public or private institutions, prefer to add these bathrooms quietly. “They want to be seen as being responsive and responsible without getting into, shall we say, the politics of gender identity, which, frankly, have been used in a divisive manner,” Berry says. There’s no hiding from the politics of gender identity in bathrooms at the American Repertory Theater in Cambridge. The A.R.T. turned its main men’s and women’s rooms into all-gender bathrooms in conjunction with a show about the lives of trans women. “It was during that time that we felt we needed to invite all of our audience members to be open to this, and then we kept it,” says Anna Fitzloff, the theater’s managing director. So now men queue with women going into what used to be the women’s room. In the former men’s room, women walk past patrons standing at urinals to enter toilet stalls. The A.R.T. explained the change to audiences via email and with new signs on the bathrooms. Staff members are on hand during shows to direct patrons and answer questions. Opening both bathrooms to all has also made it easier to move 600 people in and out of the theater during a 15-minute intermission. Fitzloff says the gender-neutral bathrooms also help moms taking their young sons to the toilet and grown sons helping a mother with dementia. Mark Lunsford, the theater’s artistic producer, says he still gets questions about the A.R.T. bathrooms, but little “fierce” opposition. But equal access to the men’s room is probably not the wave of the future. For a glimpse of the next-generation bathroom, stroll down the carpeted hall of a new UMass Boston dorm. Suddenly there’s a wide opening, with no door. A white counter with sinks and bright lights above mirrors is just inside. Three doors in a wall opposite the sinks open to small rooms with toilets and showers. UMass Boston students asked for unisex dorm restrooms in lieu of standard men’s or women’s shared facilities. “You don’t have to say who you are, what your identity is, you can just go to the bathroom,” says Chloe Strange, who supervises the RAs in the dorm. But acting on the students’ request took some effort. UMass Boston had to get a code variance from the state, which requires separate bathrooms for men and women. “We had to explain what we were setting out to do and why it was important to the university and important for inclusion,” says UMass Boston campus master planning director Andrew Weiss. He recalls the main concern was about the opening into the space, with no door, and easy view of the sink, not about the non-gendered bathrooms. Weiss says his assessment is based on the comments he hears from students and the fact that he hasn’t had any complaints. UMass Boston students can also choose singles, doubles or quads with their own bathrooms, so not all students use the shared space bathrooms. A spokeswoman for the state Plumbing Board says it has received fewer than a dozen requests for multi-user bathroom variances since 2016, and all have been approved. 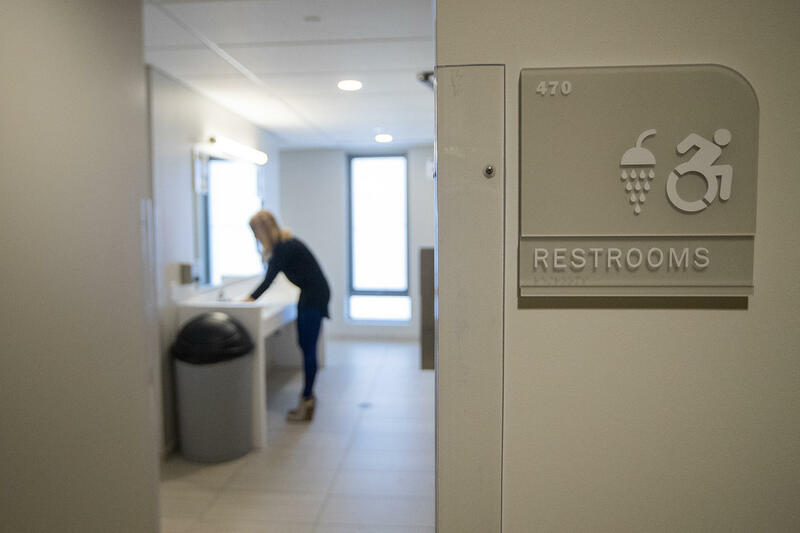 Mark Malmquist, who worked on the UMass Boston dorms project for Shawmut Design and Construction, says the gender-neutral shared bathrooms are becoming more popular in college dorms. He sees it as an evolution. The international plumbing code was revised earlier this year so that individual all-gender bathrooms, like the UMass Boston layout, count toward the required number of traditionally male and female bathrooms, but Massachusetts has not adopted those changes. David Collins, an architectural code consultant with the Preview Group in Cincinnati, wrote several of the proposals that led to the unisex code bathroom changes. There are issues with this model. Single floor-to-ceiling stalls are more expensive to build, light, vent and clean. And more privacy means less opportunity to monitor what happens behind a closed door and increases risks, critics say, for women and children. Drug users may overdose accidentally without being detected. Matt LaRue, with HMFH Architects, says the balance may be particularly difficult in schools. He’s just beginning to discuss shared space bathrooms with clients. “You can imagine in a middle school, putting students into a small closed room, which is not passively monitored, could present some problems for safety or security,” LaRue says. Back at the Tufts Health Plan, Greene pushes through a curtain of plastic, into two large bathrooms in an area the company is renovating. They will have four stalls each, sinks on the opposite side, and be open to all. Neither bathroom will have urinals. That, says Greene, is where bathrooms are headed. Greene looks to her colleague, Kenneth Livingston, who heads Tufts’ LGBTQ employee working group, and who nods in agreement. If the future of bathrooms means no more urinals, just one request for people who use a toilet while standing: Please lift the lid. Massachusetts ballot Question 3, if passed, would keep in place a 2016 state law that protects transgender people from discrimination in restaurants, stores, movie theaters and other public spaces. Should the law that prohibits discrimination on the basis of gender identity in places of public accommodation be removed from the books? That’s one of the questions that will be placed in voters’ hands in the coming weeks. The law under consideration mandates that it’s illegal to deny service to transgender people in hotels, stores, restaurants or other public places. It was overwhelmingly passed by the Legislature and signed by Gov. Baker, and has been in effect for just over two years.